After backing off over the past month and a half, Venezuela's hyperinflation is surging again, making a new high of 7459% yr/yr. On January 29th, Venezuela announced that one of its two official exchange rates was being eliminated. So, now the bolivar “trades” at one rate, under new auction rules. The official rate is now B/USD = 24,968, for those lucky enough to obtain it. But, following the elimination of Venezuela's official multiple exchange-rate system on January 29th and Maduro's announcement that the Petro raised $735 million on its ICO in late February (02/20/2018), the hapless bolivar staged something of a rally. 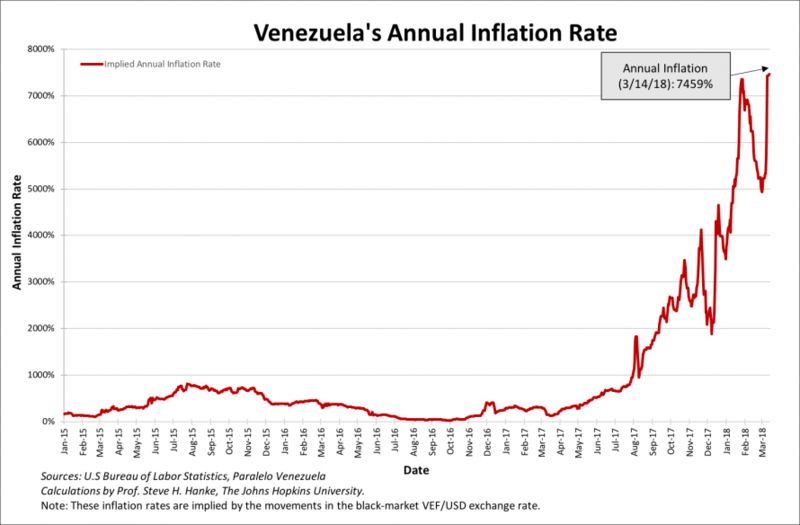 In consequence, the currency has come off its lows and Venezuela's hyperinflation has come off its highs. Some have applauded Maduro's recent moves, claiming that they will stabilize the bolivar and eliminate inflation. This, of course, is nothing more than a pipe dream. 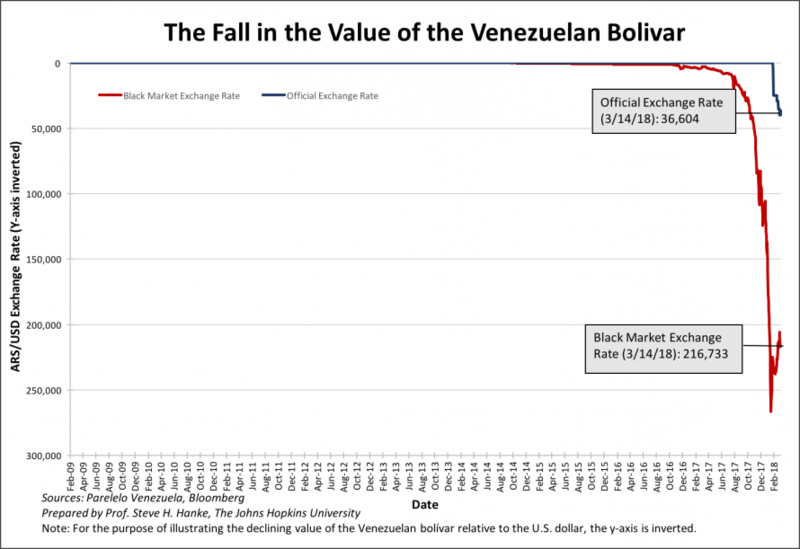 While the bolivar has strengthened a bit and inflation has temporarily abated and stabilized, the bolivar bounce is nothing more than a classic dead cat bounce. We compute the implied annual inflation rate on a daily basis by using PPP to translate changes in the VEF/USD exchange rate into an annual inflation rate. The chart below shows the course of that annual rate. Today's implied annual inflation rate is 7459%/yr, the highest in the world (see the chart below).